The first Morris Minor in the Winkworth family was bought by myself in March 1972, just as the last brand new Minors were being sold in British Leyland showrooms. It was a 1959 2-door saloon in running condition, for the princely sum of £70 (about $140). The sum was princely because I was only 17 at the time and was still in the English equivalent of High School. I learned to drive on this car, my father assisting by sitting beside me in the car every evening as I drove through the English countryside with my "L (learner) plate on the car. Unfortunately, the payment for his presence in the car was that when we came across a field of cows or horses he would leap out and collect a bucket of dung for his roses. It was always an aromatic experience! Being impressed with the value for money the Minor gave, my father sold his aging Rover 120 and purchased a 1965 Minor Traveller later in 1972, then upgraded to a 1967 Traveller in better condition the following year . Meanwhile my 1959 Saloon, followed by two other Minor saloons (£60 and £15) saw me safely through 6 years of school and college motoring. The most students I ever carried in the Minor was 6 - acceleration and braking were both pitifully slow with that load. Of course, back then in England you could buy a drivable Minor for as little as £50, and a good parts car for £10 or less. Having now caught the Minor bug, we bought and parted out 4 or 5 vehicles, ending up with a comprehensive collection of spare parts. When something failed on one of our Minors, it was standard operating practice to just grab an extra part and swap it on, no matter whether it was a light bulb or a gearbox. The mechanical simplicity of the Minor encouraged such easy and inexpensive fixes. 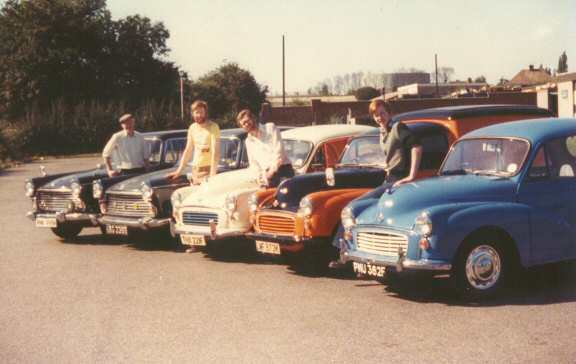 By 1976, my father had realized that with 3 teenage boys in the family, he needed something larger than a Minor, and purchased one of its bigger brothers, a 1964 Morris Oxford . The Oxford was a very comfortable car, lots of interior space and the "B" series engine had the same near legendary reliability as the “A” series in the Minor. However, as my brother was now learning to drive, we also purchased another Minor, a 1967 Saloon, in excellent condition for £400. In 1978, the opportunity arose for me to buy an immaculate 1970 Morris Oxford , and thus I also moved up, selling my Minor. This left us with two Oxfords and a Minor, but in the following year both my brothers purchased their own Minors, one a 1968 Saloon for £40 and one a 1972 ex-Post Office van, which was quickly changed from a faded yellow to a trendy black and orange. One thing we quickly found out was that the differential ratio of 5.37 in the van effectively limits one to 55mph, and a swap with a 4.22 ratio differential from a 1098cc Saloon made a big improvement. Of course, there was much effort expended on restoring the Minors, but little money was required, a point keenly appreciated by the 3 sons. And so that brings us to this 1979 photo of the family fleet: 3 Minors and 2 Oxfords, all in pristine condition. Later that year I left for Kalamazoo , Michigan , but did end up buying a Minor there in 1981. My father and two brothers bought and restored 4 more Minors in the 1980's, including a 1951 Saloon. Now in 1992, 13 years after that photo, we just have two Minors in the family, a 1968 Saloon in England and a 1963 Saloon in Kalamazoo . Of course, it's just a hobby for most people now and Minors are cult cars throughout the world that fetch astonishing prices. However, I often look at that photograph and remember the days when Morris was the first and last word in dependable, inexpensive transportation in the Winkworth family.